First of all I would like to thank the Omari's Sister crew, including the new proofreaders, for a great April! We finished all that was scheduled and even had time to throw in an extra chapter of "Orange Chocolate!" Great job, everyone! 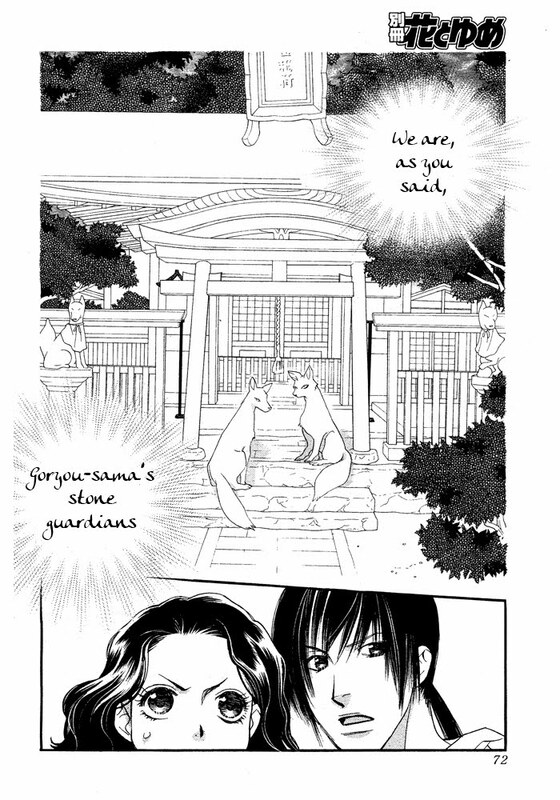 The Hana Kimi May 2010 Omake -- Sano and Nakatsu's graduation! Planning the months ahead, July has a couple of slots to fill (if I'm still unemployed...). I'll be looking over past suggestions for one-shots and short series to fill in the holes. The current front runners are to give "Love Sick" a second look and a very long one-shot that I've been staring at. Tell me how you feel about "Love Sick" or feel free to make new make suggestions! 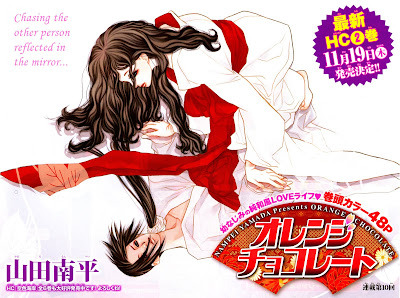 I know a bunch of you have requested chp 13 - 15 of "Hachimitsu no Hana." I have decided not to take that on unless the mangaka resumes the series with the intention to actually finish it. I've also heard requests for "Berry Berry." To be honest, I'm afraid of getting roped into that series given that past series by that mangaka have been extremely long and I don't want to get roped in multiple series that last for years. Honestly, I like short series like "Kaichou-san no Koneko." So if any of you know of some short series, that would be great! Also, if you like to join the Omari's Sister team, send me a little e-mail. I need another translator and I'm willing to train cleaners and image editors as long as you have some version of Photoshop :). Here is "Orange Chocolate" chapter 10. This chapter is a pretty low-key transitional chapter. Starting at chapter 11, things ramp up as we finally find out what Ritsu bought at the zoo. Next up is the second chapter of "Kaichou-san no Koneko." Here's a sneak peek at "Orange Chocolate" chapter 10. Help out Omari's Sister! If you purchase manga, please purchase through Omari's Sister's Amazon Associate Store! Take the quick poll in the far right hard corner of this blog! Do you like short previews and teasers before the chapter releases on this blog? I just wanted to take a few minutes to say "Greetings new followers!" I also wanted to give a special shout-out to the readers from Brazil! Thank you so much for your recent support. It means a lot to me :). I hope we at Omari's Sister can continue to bring you great manga series. It's coming up on a year since I started scanlating and it's been a blast so far! Update 7/22/2010: I just noticed a brain fart on page 18 -- it should be "living" instead of "leaving"...I updated the page and reposted the file under the same name. Update 4/29/2010: A few minor bug-a-boos have been cleaned up. The file has the same name and should now be the latest. All right! It's finished! 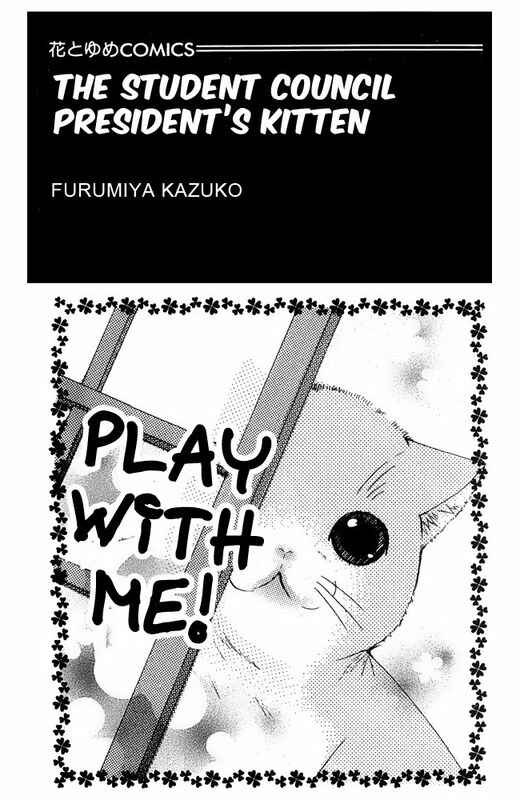 This chapter of Ouran is action packed, humorous, and sweet. And now the long wait until July to find out what happens next and maybe to find out how many chapters are left. I'm working as much as I can this weekend on Ouran chapter 80. I can't devote all my time to this weekend to Ouran because I do have a life and husband and we want to go to the movies. (Yesterday, we went on a fun day trip to see the desert blooms). 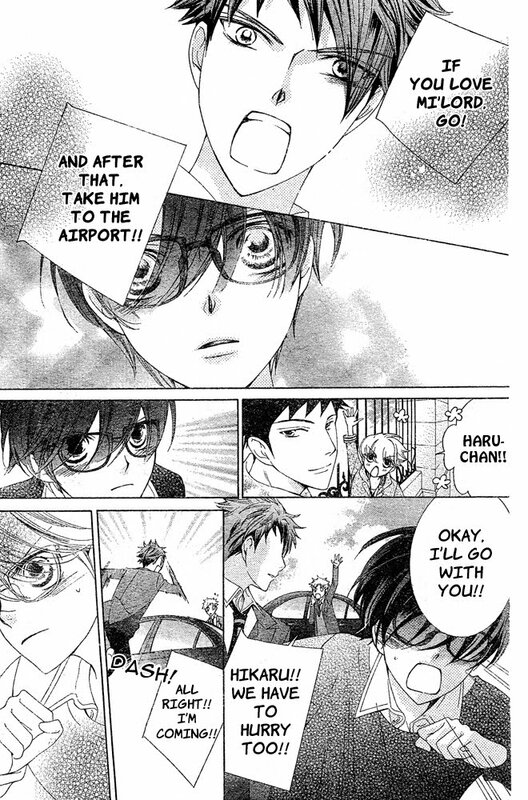 Anyhow...as I do with the other series, here's a preview/teaser of Ouran chapter 80. I will be done cleaning and editing the chapter soon. I am, though, sticking with the target completion date of 4/30 until I have a clearer estimation of when it will be done. Now for some bad news: chapter 81 will not be released until the end of July, so we have a three month wait before we see what becomes of Haruhi's ...At the end of the chapter there's a notification that beginning with Lala issue 9 the story will be rushing towards conclusion and that there will be an important announcement in Lala 8 about the planning of the story's climax. I don't know whether this is notification that the Ouran series is ending or whether this is notification about the end of the current story arc. So, in light of this, I'm going to take a wait and see stance and see what the announcement in June says and then wait to to see whether the story continues when chapter 81 is released. In light of the Ouran news, I have updated the group's release schedule. Less Ouran = more Orange Chocolate!!! Update 4/21/2010: Kuma-chan found some small errors and I've corrected them, so now everything should be good to go! Hoorays for Kuma-chan and Toune86!!! I'd like to get one more set of eyes on this before releasing, but...I guess it's okay...I hope. 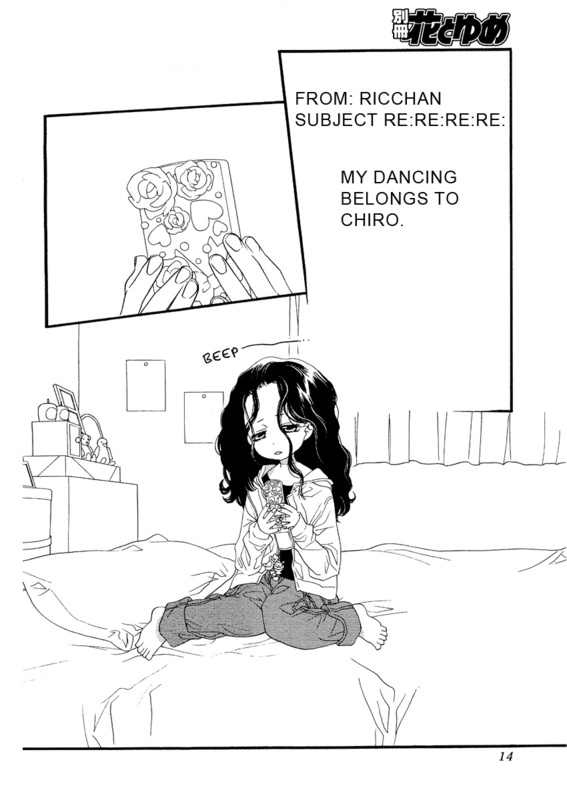 Anyhow, here's "Orange Chocolate" chapter 9. To those folks who are overly-eager uploaders, please wait until the 23nd such that if there are changes made, you get the latest version. 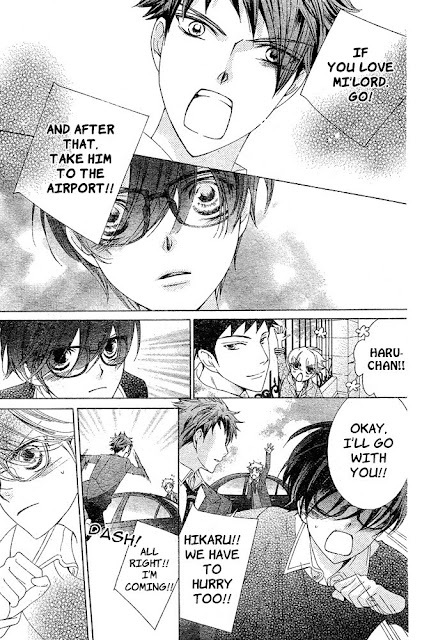 Next up is "Ouran High School Host Club" Chapter 80. Until I get the raw (it should arrive Friday afternoon at my local bookstore), I will be working on "Orange Chocolate" Chapter 10 so you all won't have to wait long to have the chapter 9 cliffhanger resolved. I just saw in the advertisement in one of the side panels of the latest chapter of "Skip Beat" that there will be another Hana Kimi omake released in May. I will take a look at it when it comes out in Hana to Yume issue 11 to decide whether I will translate it. Here's a short preview of Orange Chocolate chapter 9. I apologize for it not being very telling, but the first half of the chapter is very funny, so I don't want to spoil it and the second half is very dramatic and I don't want to spoil it either. So, I chose the preview to be the transition between the two halves of this chapter's story. I finally took my remaining 100+ manga books to a used book seller to unload them. It feels nice to have some space! For now, there are no items available for purchase through my used book Amazon storefront. I will post updates when I "restock." 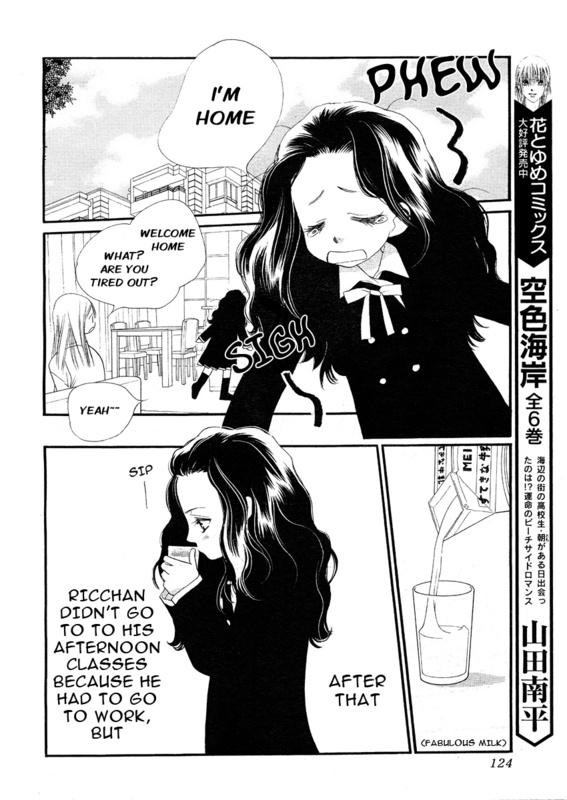 Here's a blog entry about it from another scanlation group. They also suggest an idea I support. I believe manga should be available in electronic form and I believe the Japanese publishers should pay for translation services from folks like me so they can have near real time translation of ALL of the manga series in English. I believe you all should be paying some small amount (or be subjected to advertisement) to read your favorite manga series so mangakas can continue to bring you great stories and art and translators can earn some money to continue translation (rather than doing it during his or her spare time). A comment, though, on raws. I don't provide raws because for those folks that do read Japanese, that would be straight up piracy -- it's like scanning a licensed translated manga book and posting it. And in that respect, I agree with Shuseisha. Posting manga raws most likely does materially hurt them inside of Japan. I purchase all of the materials I translate, and trust me, it's not cheap. However, because I do this, I'm not dependent on a raw provider. But still, I will not have early access to Ouran raws anymore and I really don't mind because those raws were not of very good quality. WARNING! : Comments to this blog entry contain spoilers, so read the comments after you've read the chapter. Here it is! 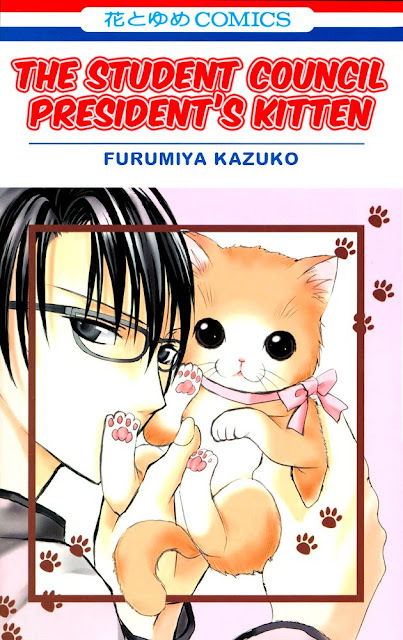 "Kaichou-san no Koneko" -- "The Student Council President's Kitten"
Short Summary: Uptight Student Council President Reiichiro Hayami gets dragged into taking care of a kitten. How will the adorable kitten, Ku, change Reiichiro's life? The whole series is actually a romantic comedy, though the romance doesn't begin until the second chapter :). I hope you enjoy it and hope to be able to bring you all more short series in the future. If you have any thoughts about KNK or one-shot or short series suggestions, please leave a comment. Next up: "Zettai Heiwa Daisakusen" chp 16! Get ready for a twist! Hahaha! I'm surprised that so many people voted that they didn't have a clue and how many think it's the Devil. I think a little Satanic intervention would be hilarious! Anyhow...we'll all know in a couple of weeks who it is. 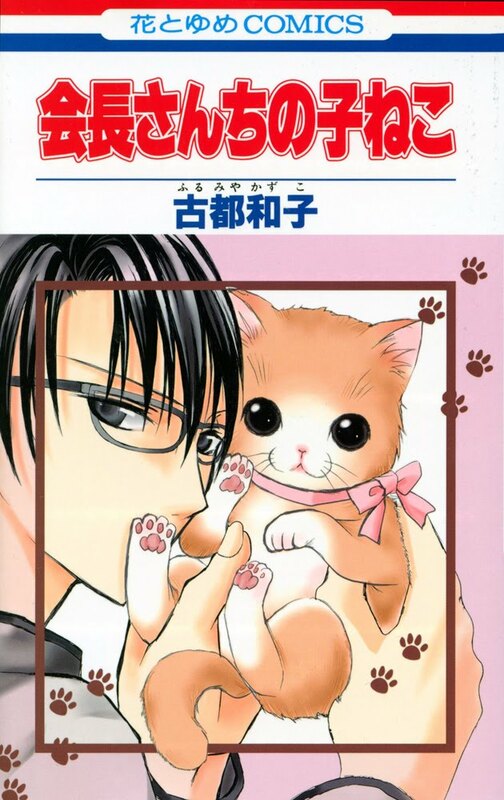 Here's a preview of "Kaicho-san no Koneko:"
Update 4/8/2010: The mini-series includes three chapter of Kaicho-san no Koneko, one side story, a one-shot called "Gakuran Ouji" ("Gakuran Prince" -- a "gakuran" is a boy's school uniform that has a long jacket with a stand-up collar and loose pants), and a very short KNK extra story. 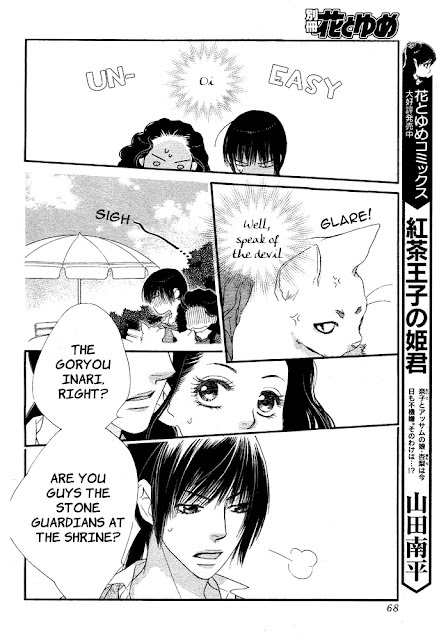 "Gakuran Ouji" has already been translated into English, so we will skip it, but will scanlate the rest. I've translated about 60% of the first chapter and it's a good mix of humor and sweetness -- very much along the lines of "Orange Chocolate." 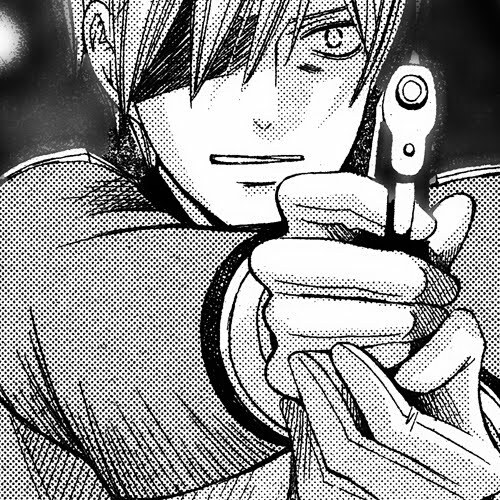 Cleaning this manga isn't a lot of work, so I think once it's translated, I can finish the editing in a day or two. Because of this, I've decided to pull the first chapter up to April, with a new ETA of 4/12. I will try to put out a short preview of the series tomorrow. Thanks to everyone who volunteered to help proofread! I now have a nice pool of proofreaders, so, hopefully, I won't have any emergencies soon. Recruitment, though is still open. I also need a back-up translator, so if you know a fair amount of Japanese and want to help, sent me an e-mail (link). And now onto why your here, Orange Chocolate chapter 8! I like this chapter because Chiro's reaction to recent events are uniquely "Chiro" and quite funny. She has her own strange view of the world ;p.
It looks like I've got a few days until I get the raw for ZHD, so we'll start working on "Kaicho-san no Koneko" and I will work on my websites. Japanese in Anime and Manga Website Updated! We would like to express our deepest thanks for your article and comments regarding the ‘Japanese in Anime & Manga’ website (http://anime-manga.jp, produced by the Japan Foundation, Japanese-Language Institute, Kansai). and “Samurai Expressions by Scene”. Please take a look! More good stuff to learn a little bit of Japanese in a fun way! Short Term Proofreaders Needed Immediately! Orange Chocolate Chp 8 will most likely be ready for proofreading my time (PST) in the early evening tomorrow. If I get a proofreader, then it could be released as soon as the 7th. Hopefully, with this explanation we all now understand that there is NOTHING out there that indicates that Ouran is ending anytime soon. I suppose this is a good thing, considering that Ouran is quite popular and there's a general consensus there's a lot of potential story left. Wow! It's April! The release schedule and release archive have been updated! This month Lala DX 5 comes out with ZHD Chp 16! Supposedly it covers the beginning of Johanne and Yuda's wedding celebration! We're very excited about this chapter! 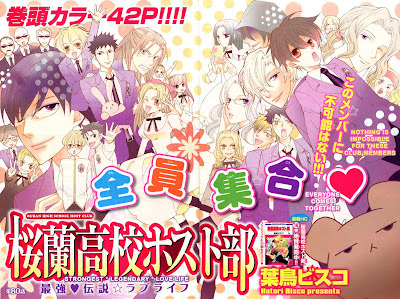 Later on this month in Lala 6 is the next chapter of Ouran. 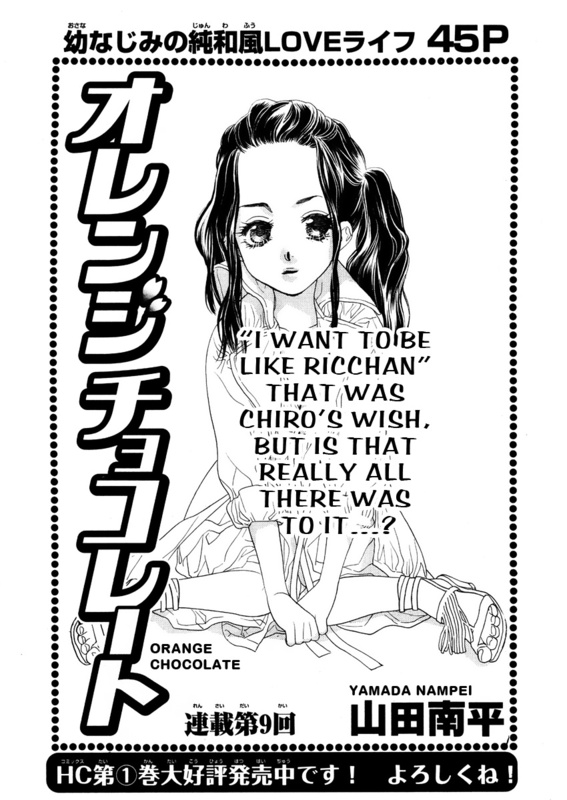 We'll will also try to deliver "Orange Chocolate" chapter 8 and 9. Look forward to it! More good stuff this week! 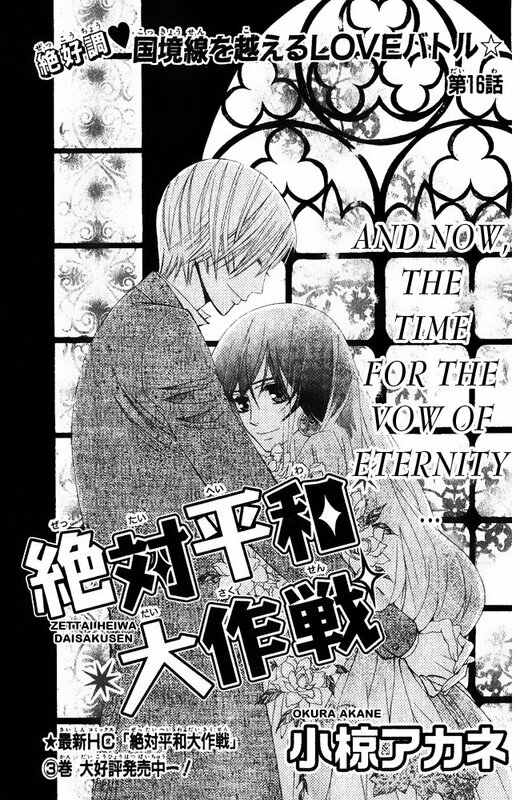 Kaicho wa Maid-sama!, volume 4 3/5 -- I skimmed over most of the side character action. There's too much of it, as usual, and it's pointless. Mixed Vegetables, volume 7 4/5 -- very cute!